If you get your knowledge of science mainly from the TV, you might have the impression that it’s a weird activity, very far from what most people care about. But science isn’t remote at all: the world is connected in strange and wonderful ways. Think about this: many of you have a cd player. You can take it anywhere–on the beach, up a mountain, through the forests, in the deserts, at the North Pole, even–and listen to music reproduced almost perfectly. That wasn’t possible before in all of human history. In previous centuries, if you wanted to hear music, you had to go to live performances. But now we have this fantastic freedom that anyone, in any part of the world, can share the experience. In a way, it’s the ultimate democracy: making available to many what could previously be enjoyed only by a few. How has this come about? Strange as it seems: through a physicist’s dreaming. Inside every CD player is a laser. Its light bounces off the bumps and pits on the disk, and electronics converts the signal into sound. The laser wasn’t discovered by accident. It was designed, by applying our understanding of waves and particles of light that comes directly from quantum physics, which gives our deepest understanding of the strange tiny world inside atoms and smaller. The laser works on a principle discovered by Einstein nearly a hundred years ago. It was pure theory–dreaming while you’re awake. He never dreamed that fifty years later other scientists would apply this principle to create bright pure light. Nobody imagined that engineers would use little lasers to read music. It isn’t only lasers: the electronic circuits that convert the music into sound contain millions of transistors–another device designed using quantum physics. And it isn’t only physicists and engineers. To design how the bumps and pits on the CD represent the music involves mathematics: arithmetic, trigonometry, algebra–just those subjects where you hear people, who should know better, wonder if they’re any use. And of course it’s not only CD players. Every supermarket checkout has a laser, and every mobile phone has millions of transistors. The point I’m making is that these are quantum-physics machines, applying very abstract ideas to practical inventions we use every day. I’m a theoretical physicist, working at the abstract end of this chain of connections–a dreamer and a scribbler, of mathematics, mostly. It’s a mistake to think that only mathematicians do mathematics. Sometimes in physics you need mathematics that hasn’t been invented yet, so we make it up ourselves, and mathematicians come later and tidy it up. Of course, it happens the other way too–we need to do some new types of sums, and find that a hundred years ago mathematicians have anticipated us, with pure thinking they never imagined anyone would find useful–the laser story again. My work is about waves–in light, on water, in quantum physics, and other sorts of waves. It’s the connections that excite me–to start trying to understand why images in big telescopes get blurred, and then find you’ve explained the bright dancing lines of light on the bottom of swimming pools. It’s a good life, and suits me personally because I’m not a very competitive person. This might seem strange, because again the popular image, encouraged by the media, is of scientists at each other’s throats, fighting to get their discoveries published before other people, competing for research money. As with any human activity, that does happen sometimes. But in all my years as a scientist I’ve almost always encountered the opposite: not competition but friendly cooperation, sharing results. This isn’t because scientists are better than other people: in our private lives we’re not different from anyone else. We cooperate simply because the ways that nature works are so well hidden that no individual can discover them by himself or herself. We’re much cleverer together than separately, so it makes sense to cooperate. And the cooperation works across all cultures, nations, races, religions. Whether I’m in the UK, the USA, Africa, China, Lebanon, or Israel, there’s immediate communication and understanding (thank goodness every scientist speaks English). When I started, I never knew any of this–about dreaming, about connections, about travelling, about cooperation. In my family, only one cousin had any education beyond sixteen. It wasn’t a rich or a happy family: my father, who was a taxi-driver, was a violent man, and my mother spoiled her eyesight taking in sewing to make up for the money he gambled away. I was lucky to be born into a society where you didn’t have to be rich to get educated. Education is the key. Earlier, I wrote ‘himself or herself’. Half the world’s children are girls. Why is so much of their creative talent wasted? I have something to say about this. First of all, there’s this image of science as a masculine activity. It’s just wrong. I mentioned cooperation rather than competition. That’s traditionally much more a feminine than a masculine characteristic. Then there’s this image of science as lots of gadgets: toys for boys. Well, I enjoy cooking, and I’m pleased to have a colleague who studies the science of cooking–he calls it molecular gastronomy. It’s physics and chemistry, applied to what we call ‘soft condensed matter’. He’s collaborating with a leading chef, to create new and wonderful dishes–for example instant perfect ice cream, made by dunking the mixture in liquid nitrogen. Again, there’s a weird view that it’s awkward being a scientist and raising a family at the same time. My wife is a biologist working in our Eye Hospital, trying to understand the miserable disease of dry eyes. She was studying when our babies were born, so for the first eighteen months of their lives I raised them in my office–an interesting experience, unusual for a man, which taught me a great deal (about the liberating technology of disposable diapers, for example). Things are changing. Last year I was on two committees. One was to award the main prize in Britain for research in mathematics. After 150 years it went to a woman for the first time. The other committee gives grants to support the six brightest young mathematicians in Europe; our two top awards were for women. And in Britain, the best scientific research jobs for young scientists, in all subjects, come from the Royal Society of London–that’s our Scientific Academy. They give several hundred grants each year. Last year, many of their grants went to women. Things are changing. The excitement of scientific discovery is the inner knowledge it gives us, the quiet satisfaction at something understood. In science, when you discover something new, even a small thing, you’re floating on a cloud for days. That’s what delights me. 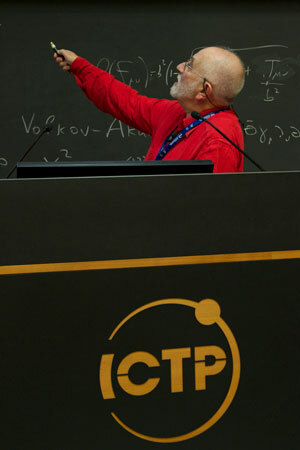 Professor Sir Michael Berry is the Melville Wills Professor of Physics (Emeritus) at the University of Bristol and has frequently visited and taught at ICTP. ← Is Earth Science Education Forgotten in Africa?